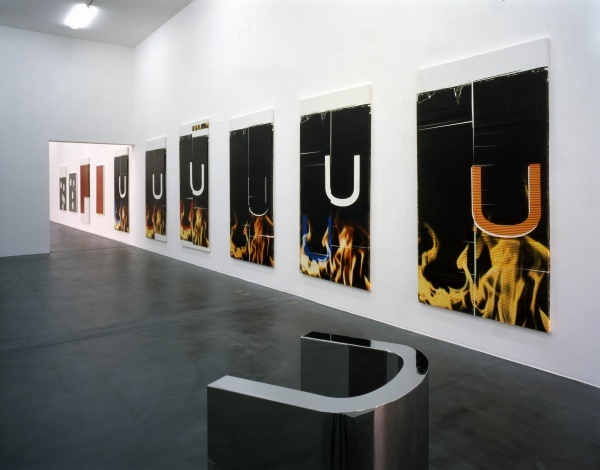 Wade Guyton showed his works at the Kunsthalle Zürich for the first time in the group show “Wade Guyton, Seth Price, Josh Smith, Kelley Walker” in 2006. The exhibition presented the four artists’ dialogue about and exploration of all possible technologies from everyday digital life and their conditions. It also demonstrated how these technologies allow questions concerning authenticity and chance to take effect in the artists’ works through the juxtaposition of different reproduction technologies and the exaggerated use of genres, materials and their application. 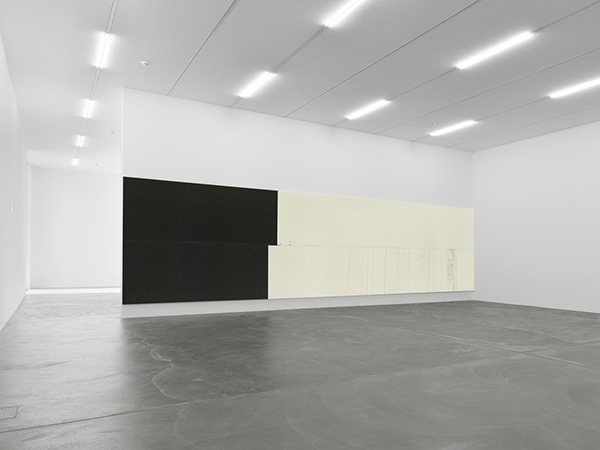 Following the first retrospective survey of his work at the Whitney Museum of American Art in New York last autumn, Wade Guyton (born in 1972 in Hammond, Indiana, lives and works in New York) now shows two large-scale presentations specially created for the exhibition at the Kunsthalle Zürich, which electrify the concepts of painting and drawing in an experimental way in the context of the exhibition space. 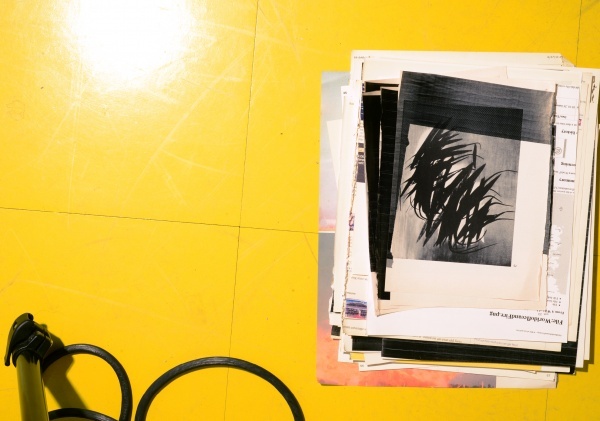 In a group of table vitrines which encompass the entire space, Guyton unfolds what he signifies as “drawing”: a universe of manipulations, layerings and relations of and between overprinted, found and decontextualised images. 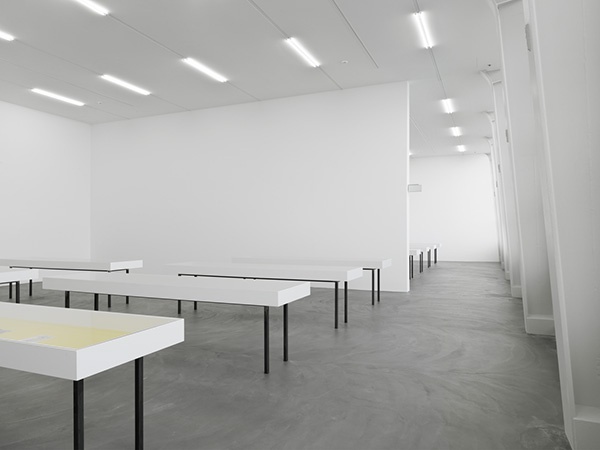 In the yellow-tiled kitchen of his studio, Guyton photographed images and then reproduced them and composed them on the same yellow tile material in the exhibition to form a new image: the artist’s studio, exhibition space and presentation formats unite to form a complex extended space for production processes and reproductions – one that is further extended in the format of a book Zeichnungen für lange Bilder. Kunsthalle Zürich 31.08. 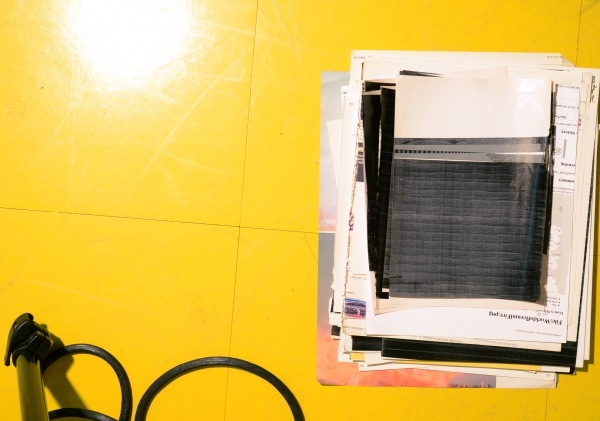 – 10.11.2013 which documents the work on the images in this installation and refers to the exhibition’s second installation. 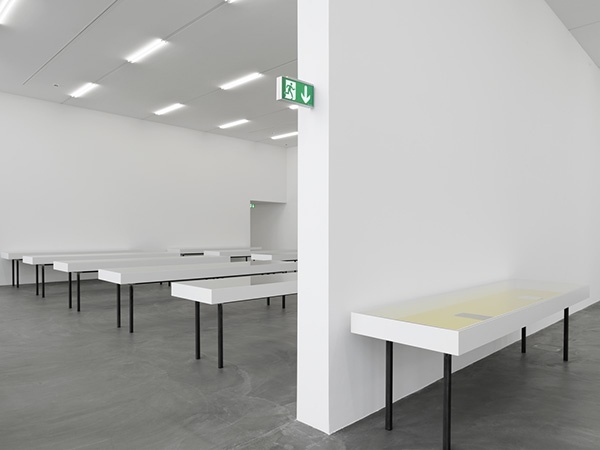 The “long images” tautologically double the exhibition walls on the second floor of the Kunsthalle Zürich. 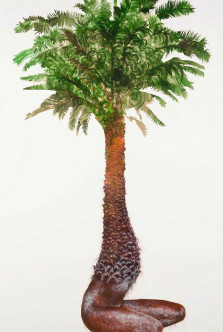 Printed on linen using an Epson Stylus Pro 11880, the artist rotated his paintings, which are informed by a computer image, to a horizontal orientation and extended their information content to fill the entire wall. These abstract images are shaped by chance and the failure of the printer on the digital and physical material. 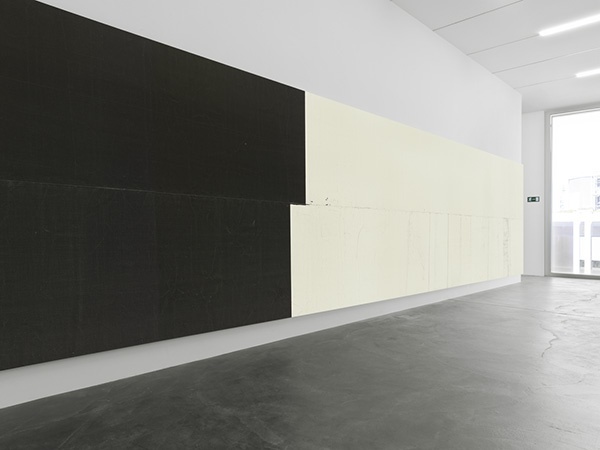 Like the multiple processes involved in the production, reproduction and re-use of printed material in his drawings, Wade Guyton also adopts an experimental approach to painting. Instead of traditional tools, he deploys modern technologies and thereby tests the possibilities, limits and processes of the form. 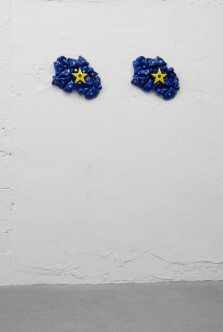 Guyton works from a conflictual dialogue with both the modernist tradition and abstraction, and with technology. He forces the canvas through a printer which is intended for printing digital content on paper but not on this support. 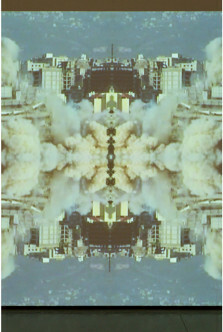 He exploits this misappropriation of the machine as a generative process for the production of images – a misappropriation that prompts the images’ digital information to present unexpected results. The forcing of the canvas through the printer, the spluttering or failure of the digital image information gives rise to errors in the execution of the colour ranges, and to staining and distortions. These are frequently reinforced by the difficult manipulation of the canvases in the studio where they acquire additional traces and damage from the floor or as a result of their handling. 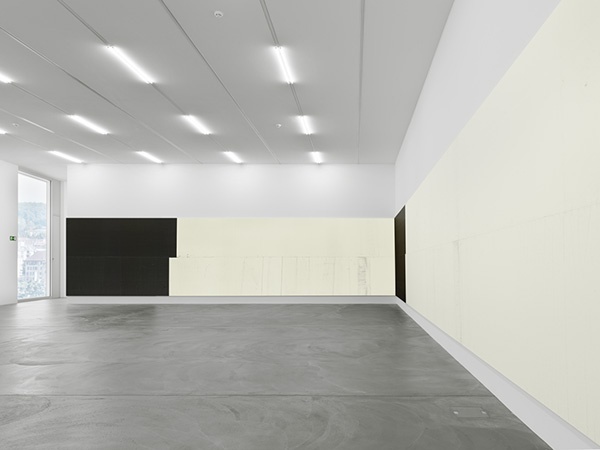 Wade Guyton’s work constantly evades any attempt to confine it to a specific approach or area of investigation. 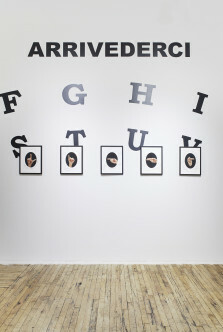 One of his many collaborative projects “Continuous Project” (established in 2003 with Bettina Funcke, Joseph Logan and Seth Price) explores and blurs the relation between past and present and archive and memory by manipulating, reproducing and re-enacting documents, events and discussions that would otherwise have disappeared. 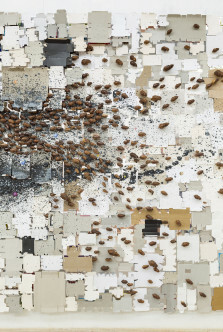 Guyton’s work highlights the issue that no formal investigation can completely evade questions about meaning. For this reason, his paintings and drawings, which operate with themes of abstraction and the monumentality of these themes, are always fundamentally conceptual and not aesthetic. The artist not only formally “defiles” his works but also contaminates the concepts and values of inherently artistic themes with the very latest technologies. 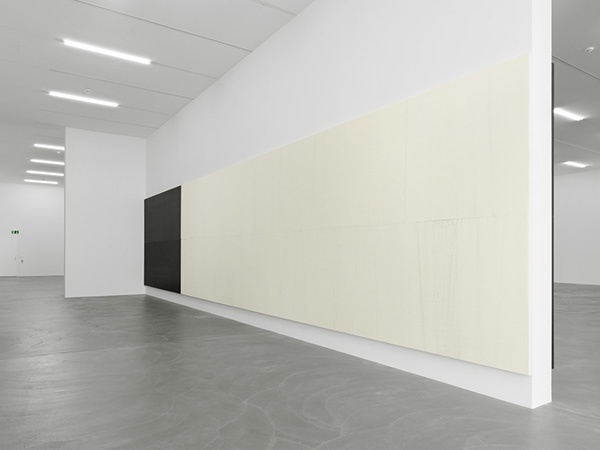 Wade Guyton’s work also repeatedly explores and dismantles myths and the narrative transmissions of abstract art. 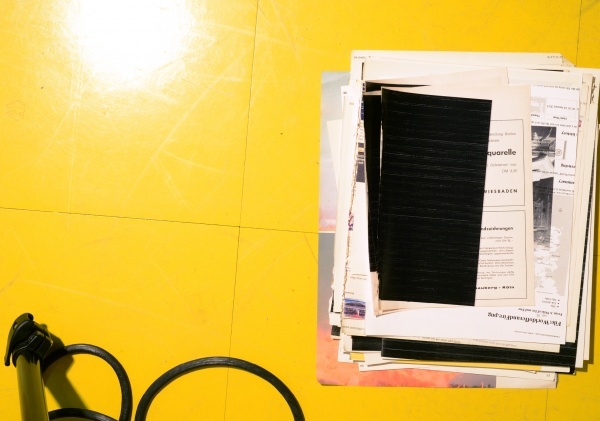 How should an abstract image be understood today? What questions have we to ask of the non-representative? To which aesthetic seductions do we succumb? What is distributed and transported, and how? 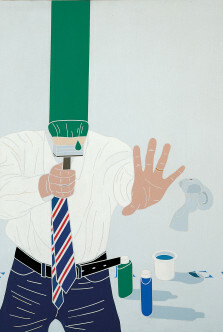 Guyton explores the posture, seduction and failings of formal aesthetic concerns and consciously irritates our aesthetic values and conventions precisely because he wants to establish through his works what these can mean today and how they vary in technical production process and strive to be reformulated. 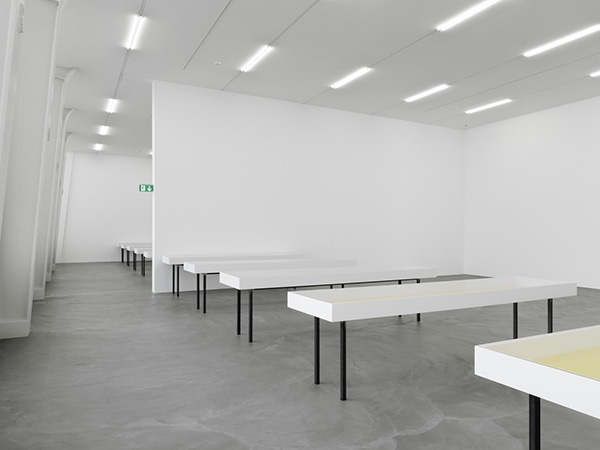 In the two installation presentations in his exhibition at the Kunsthalle Zürich, Guyton combines his conceptual, radical and poetically elegant treatment of questions surrounding originality, continuity and the location of the exploration of images in a digital world in an exemplary way.